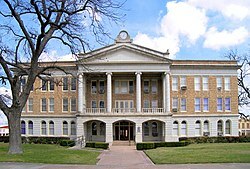 The Uvalde County Courthouse was built in 1928 in neoclassical design. It is the fifth structure used as the county courthouse,having replaced the previous building constructed in 1890. Comitatul Uvalde (în engleză Uvalde County) este un comitat din statul Texas, Statele Unite ale Americii.